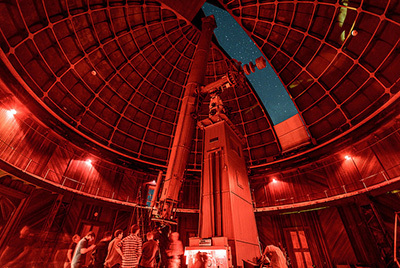 For over 35 years, the Summer Series program at UC's Lick Observatory has drawn concert fans and astronomy devotees to the summit of Mt. Hamilton for live music, evening astronomy lectures from world-renowned scientists, and the opportunity to view celestial objects through historic telescopes. The Summer Series, expanded due to public demand, now includes six Music of the Spheres dates and six Evenings with the Stars dates, and the observatory also offers 20 Public Evening Tours. Tickets to these events tend to sell very quickly and will be available to the general public online at www.ucsctickets.com, starting promptly at noon on Wednesday, April 17. Each Music of the Spheres concert features a musical performance, an astronomy lecture by a scientist, and a history presentation about Lick Observatory’s rich past. Afterward, guests take turns viewing celestial objects through the 36-inch Great Lick Refractor and the 40-inch Nickel Reflector. Guests have additional opportunities to stargaze with small ground telescopes provided by amateur astronomers. The Music of the Spheres concerts take place June 8 (Oscar Reynolds and Karumanta), June 22 (Golden Bough), July 13 (The Quitters), July 27 (White Album Ensemble), August 10 (Folias Duo), and August 24 (Dave Rocha Qaurtet). For additional details and ticket information, visit www.ucolick.org/summer. The Evenings with the Stars program gives the public a chance to view through the 36-inch Great Lick Refractor and the 40-inch Nickel Reflector as well. Similar to the Music of the Spheres events, each program features an astronomy lecture by a “star” scientist and a history presentation. Amateur astronomers also set up ground telescopes so that guests can get additional telescope time. Dates for the Evenings with the Stars are June 7, June 21, July 12, July 26, August 9, and August 23. For additional details and ticket information, visit www.ucolick.org/summer. 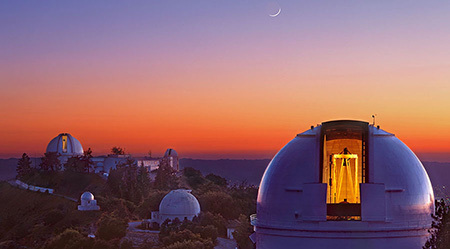 The Public Evening Tours offer an expert-guided, four- to six-hour "behind-the-scenes" walking tour of Lick Observatory. Participants can learn about the unique history of the world’s first permanently occupied mountaintop observatory, the eccentric California pioneer James Lick, technology used for observing on different telescopes along the tour route, and current science being conducted at Lick Observatory. After dark and weather permitting, guests can view celestial objects through the historic 36-inch Great Refractor telescope. For dates, additional details, and ticket information, visit www.ucolick.org. Please note: Weather may restrict telescope viewings, but other activities will still take place. Due to historic construction of the telescope domes, the 36-inch Great Refractor and the 40-inch Nickel Telescope are not wheelchair accessible at this time. Children must be at least 8 years of age for admission. Due to late hours the program may be difficult for children under 12. Music of the Spheres is for ages 12 and over only.